However, to have a closer glimpse, do not hesitate to leave the shore and challenge yourself with something new and interesting on the river. Can Tho – the largest town in the delta and the rice basket of Vietnam is one of the best places and the most popular to do this. Why the floating markets atmosphere attracts tourists? 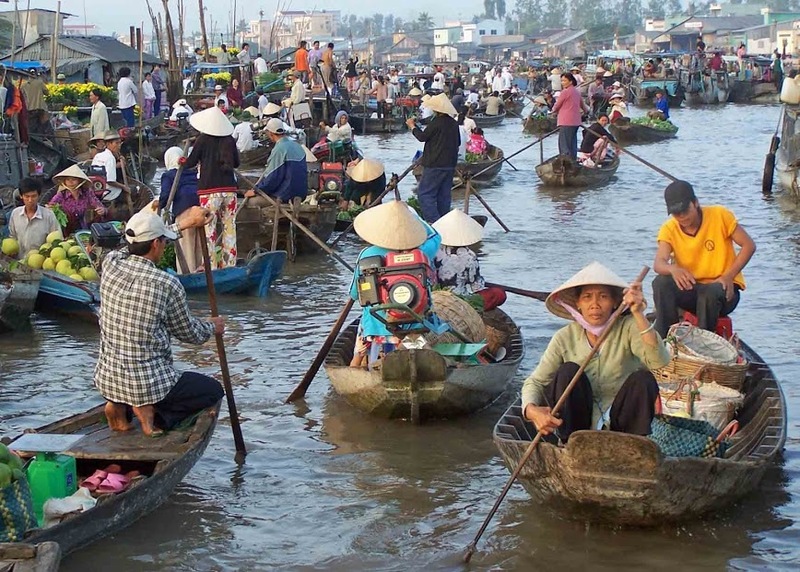 Checking out Can Tho well known floating markets, which have existed for a long time in the region, is the main reason why visitors come to this city. With vessels of different sizes and degrees of comfort and trips ranging from four to eight hours, there are a number of ways to see the markets. The package holidaymakers can choose large, powerful boats providing a sanitised experience, but opt for a trip by sampan instead for something a little more amazing (plus the ability to traverse the small waterways on the way back to town). These highly recommended floating markets are believed to make the most of countryside experience. 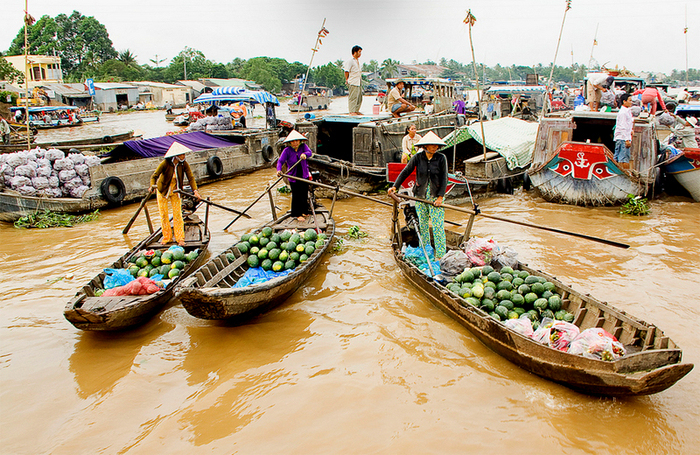 The floating markets and associated river life are the most interesting sights in the Delta. Very early in the morning, big-sized boats anchor and create lanes where smaller boats weave in and out of making the waterway a network of hundreds of boats fully packed with pineapple, papaya, bananas, mango and even smuggled goods such as cigarettes. Most of items sold here are farm products and specialties of Chau Thanh District, Cai Rang Town and these neighboring areas. Not really a spot for souvenirs, Cai Rang is where people come to buy large number of goods, mostly foodstuffs, and get an idea of how the water commerce in the Mekong Delta is like. Therefore, travelers can study the cultural aspects of southerners through these activities at the market. Roughly 15km away from the Can Tho City center, Phong Dien is the second market to remain trading activities until the afternoon. 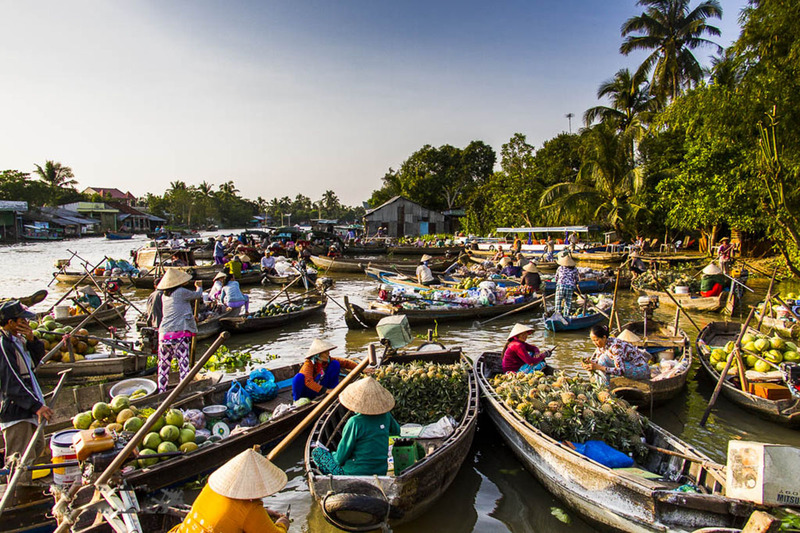 Unlike the whole sale market of Cai Rang, which abounds in huge heaps of diverse commodities, Phong Dien Floating Market is where you can find not only agricultural products but also many other ones. Besides boats selling household and working tools such as knives, hoes, roofing sheets, machete, canoes, boats and all kinds of general domestic and foreign cargoes and weaving products as baskets or fishing tools like fishing nets, there are also many boats selling various types of dishes: Hu Tieu, rice soup, noodle with toasted meat, noodle soup and coffee, etc. The pillar – a part of bamboo tree plugged in front of the boat, with products hung on is one of the unique features of floating markets in the Mekong Delta region in general and Phong Dien Floating Market in particular. Without noisy and gushy advertisement language, but exotic and appealing buyers, the form of promoting and selling products is also a unique culture feature only available at floating market. To find what to buy, all you have to do is to look at the pillar. 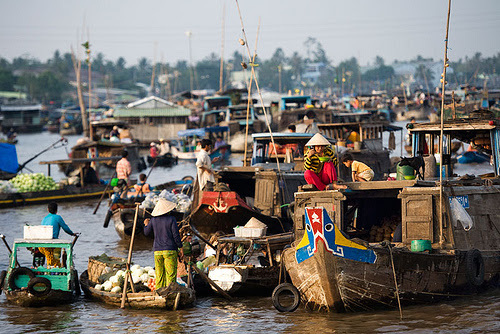 A trip to Phong Dien Floating Market gives you an amazing opportunity to enjoy the most typical experiences of floating markets as well as feel the real local way of life in the Mekong Delta region. No matter how time-lapse changes, Phong Dien retains its own characteristics making it so special and always bringing tourists a lot of amazing sense at any daytimes.